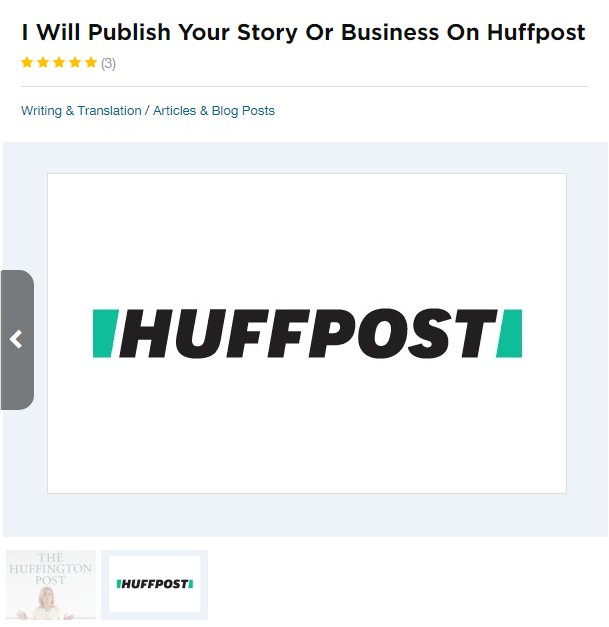 Last month, I blogged about the HuffPost’s retraction of a paid article published via its contributor platform that was intended to burnish the reputation of former Trump advisor Felix Sater. 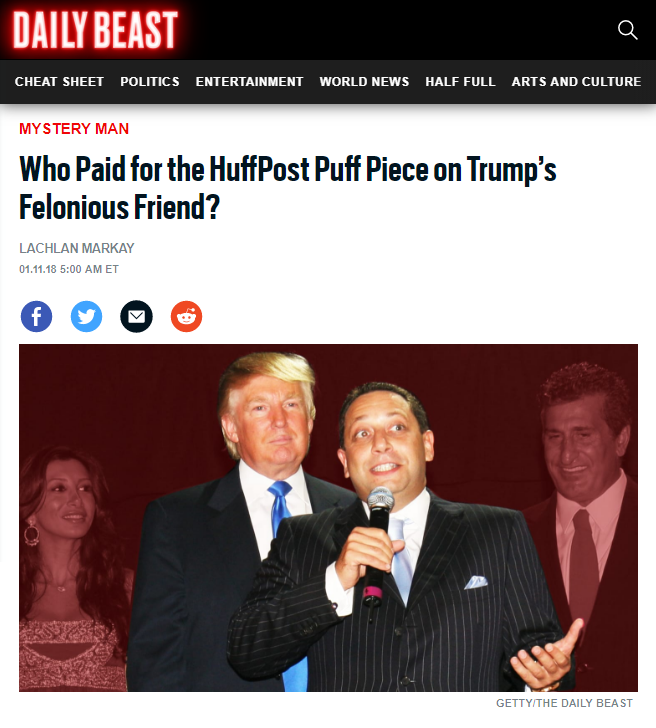 HuffPost scrubbed the article, written in December, from its website after a blogger in Northern Ireland, Dean Sterling Jones, inquired about the piece,* which hailed the dismissal last year of a $250 million tax fraud case against Felix Sater, a Russian-born former Trump Organization executive. But the site’s days of encouraging everyday citizens to report on the news are over. 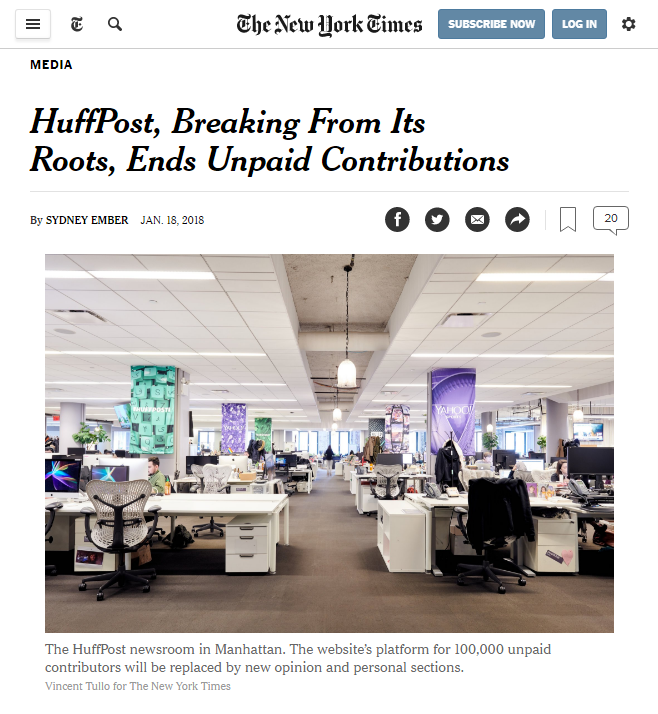 On Thursday, it said it was immediately dissolving its self-publishing contributors platform — which has mushroomed to include 100,000 writers — in what is perhaps the most significant break from the past under its editor in chief, Lydia Polgreen, who joined the news site, which is now called HuffPost, a year ago. The decision was rooted as much in a move to declutter the site as in Ms. Polgreen’s desire to focus on quality reporting and minimize unvetted stories at a time when there is so much misinformation online. “Certainly the environment where fake news is flourishing is one where it gets harder and harder to support the idea of a ‘let a thousand flowers bloom’ kind of publishing platform,” Ms. Polgreen said. 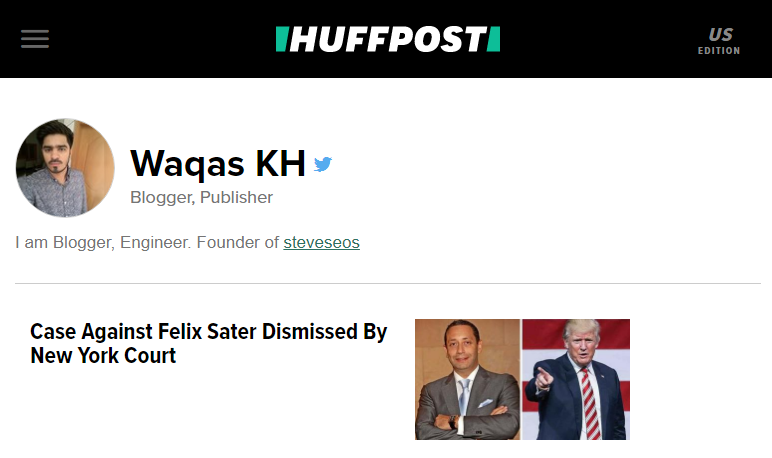 Recently, for instance, a contributor with the byline Waqas KH published an article about Felix Sater, an associate of President Trump, that he had been paid to post. The site has since deleted the article. 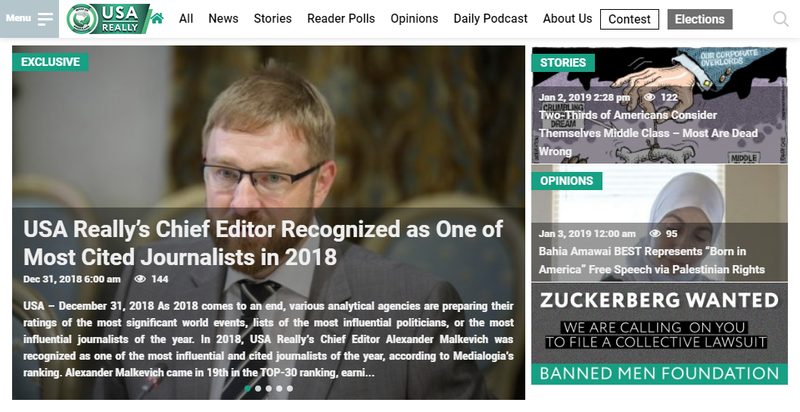 In place of the unpaid contributors platform, the site introduced new opinion and personal sections that will include paid contributors who will work with HuffPost editors. The closedown was subsequently covered by Politico, Variety, The Chicago Tribune, and Fox News, among others. *Actually, the article had already been deleted when I inquired about it. 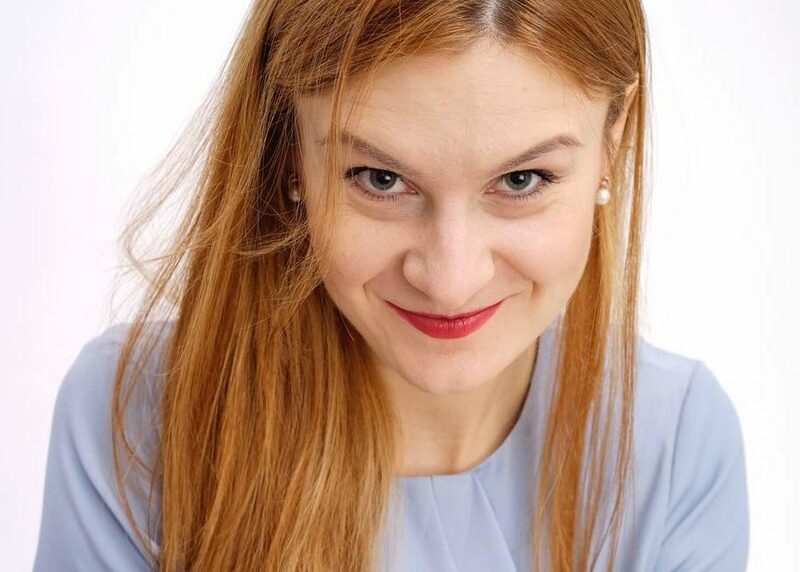 Last week, I blogged about a coordinated PR campaign seemingly intended to burnish the reputation of controversial Russian-American real estate investor Felix Sater, who collaborated with Trump on a number of high-profile development projects. 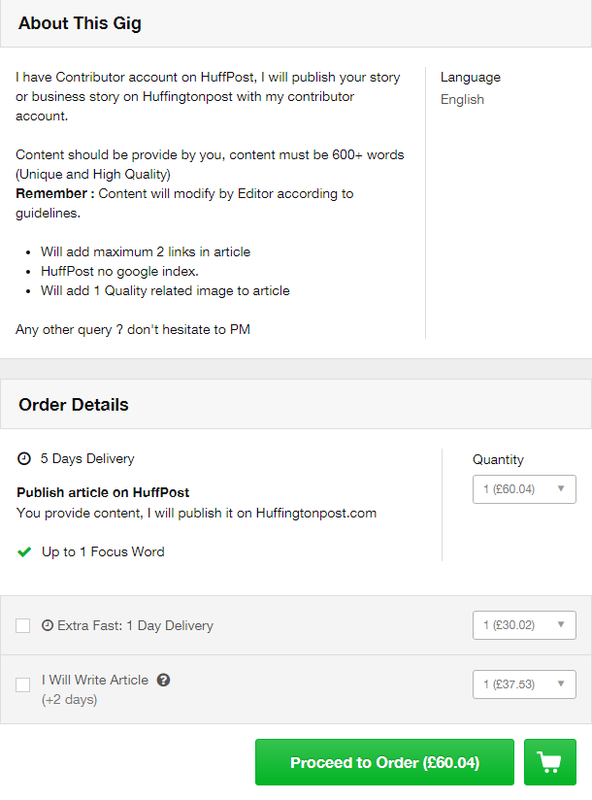 Now it emerges that U.S. news website, HuffPost (formerly The Huffington Post), has retracted an article it appears was part of the fake news campaign. 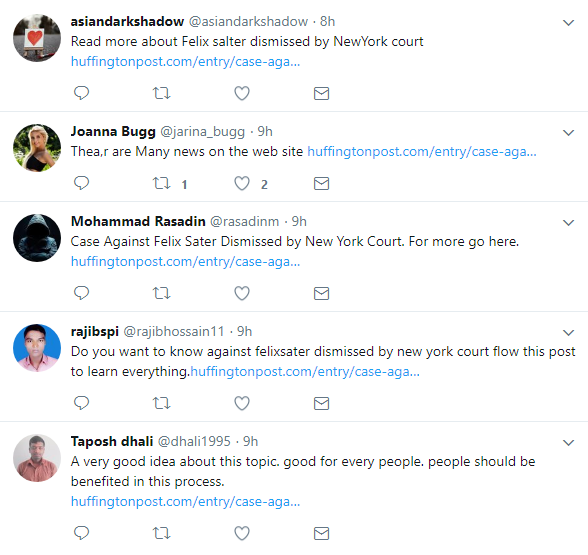 The deleted article, “Case Against Felix Sater Dismissed By New York Court,” was published by Waqas KH, founder of Pakistani SEO marketing website, SteveSeos.com. In an e-mail, Waqas confirmed that someone paid him to publish the article, but wouldn’t say who. 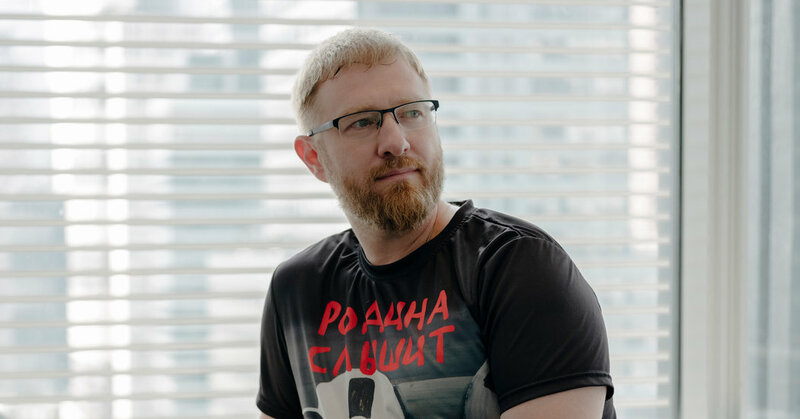 The article is just one of several recent news items about Sater that have popped up on pay-to-publish digital marketing websites, and which are currently being spread by dozens of fake Twitter accounts. 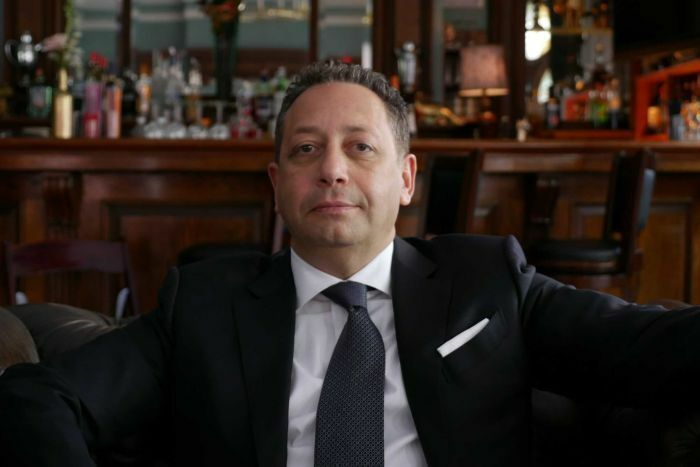 Sater denies knowing about any efforts to burnish his reputation.